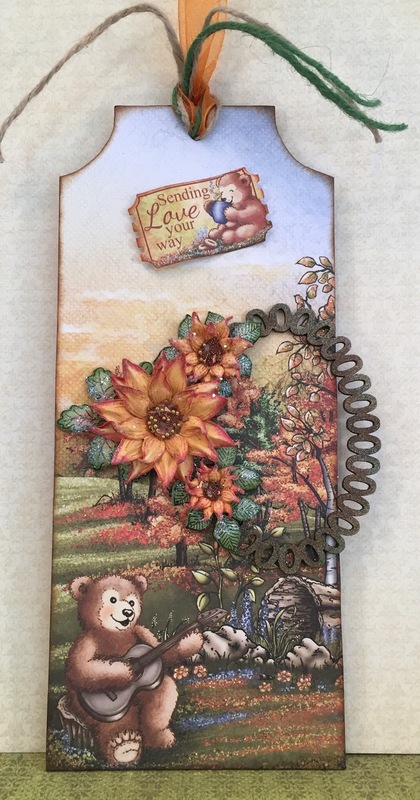 I can't get get enough of this Beary Fun Retreat Collection! I love everything about it...the bears, the accents, the colors!!! It's absolutely beautiful! Today I created a beautiful tag for you!!! Other Products Used: Orange Ribbon, Natural Jute, Green Jute, Gala Glitz Brown, Sparkle Sheer Shimmer Spritz, Big Shot Plus, 8 3/4”x 3 3/4” Chip Board Tag, Wooden Oval Frame, Clear Wink of Stella, Distress Ink Vintage Photo, Hot Glue Gun, Scissors. Instructions: Trace the tag on paper from the paper pad, cut out with a scissor, ink the edges with Vintage Photo ink and adhere the paper to the tag using Dries Clear Glue. Paint the bear, rocks and log with Wink of Stella. Glitter the flowers and tree leaves on the paper with Lion’s Mane Glitter. Paint the wooden frame with a combination of Copper, Walnut Brown and Moss Green 3D Stamp Paints. Stamp the leaves from the Sunflower Accents Cling Stamp Set with Tuxedo Black ink and color with Bamboo Leaves, Peanut Brittle and Rhubarb Stalk inks. Stamp the Classic Sunflowers with Potter’s Clay Ink and color with Harvest, Peanut Brittle and Rhubarb Stalk Inks. Shape the flowers and leaves using the Deluxe Flower Shaping Kit and spray them with Sparkle Sheer Shimmer Spritz. When dry, glitter them with Rajni Chawla’s Crystal Clear and add Brown Gala Glitz to the centers of the sunflowers. Adhere the flowers, leaves and frame to the tag using a hot glue gun. Using the Luggage and Tags Die, cut out the Sending Love Your Way Tag from the paper pad, shape, glitter and adhere to the tag. Attach the Ribbon and Jute to the tag as shown. Please leave a comment before you leave...your comments make my day! Beautiful tag - the sunflowers are just gorgeous! What a wonderful tag Janet! I love the way you did the centers of the sunflowers, so realistic! Beautiful!